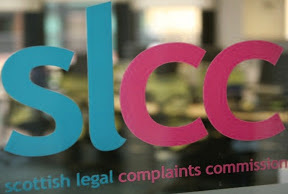 Scottish Legal Complaints Commission refuses to disclose members expenses claims. 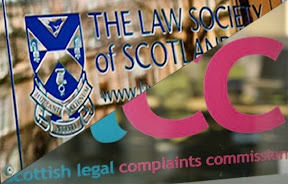 POTENTIAL MENTAL HEALTH & SAFETY PROBLEMS of four lawyers and four ‘lay people’ (two of whom are ex-senior ranked Policemen, one of whom actually served on a Law Society of Scotland Committee) have been raised by the beleaguered, scandal hit Scottish Legal Complaints Commission as excuses for refusing to disclose board members expenses, this coming after the SLCC has today been stung by claims from solicitors clients, consumer groups, & even politicians that the Commission operates an anti-consumer complaints system which has after one year, yet to have a single success for a client. SLCC Chair, Jane Irvine – our members ‘mental health’ is on the line. Jane Irvine's written refusal of full disclosure over members expenses details stated : "I have studied each and every record we hold and am perfectly satisfied that the SLCC is entitled to extract the information from records held, namely what was claimed and paid. Further that the actual claim forms etc which you now state you require are both confidential under s.36(2) and personal data under s.38(1)(b) thus we may withhold the records as exempt." Ms Irvine staggeringly went on to claim the full release of expenses claims details may harm the safety or mental health of SLCC board members. Jane Irvine : "In addition, I consider we can withhold them under s.39 in that release might endanger the physical or mental health or safety of an individual." SLCC Chairman Jane Irvine’s extraordinary about-turn on Freedom of Information compliance policy by the joint public-legal profession funded Scottish Legal Complaints Commission, comes after the SLCC, which has so far received a staggering two million pounds of public money from the Scottish Government, received an FOI request for the expenses claims made by its members, which can be revealed today at a staggering £128,624.00 on fees alone in an eleven month period. Jane Irvine claimed SLCC members with huge expenses claims might ‘face mental health problems’ if details of their salaries were disclosed. A legal insider today attacked the SLCC's decision to resort to secrecy over members expenses and said today : "This is deplorable. It seems when the going gets tough, the SLCC stoops to secrecy in order to protect itself from accountability on issues like members expenses. 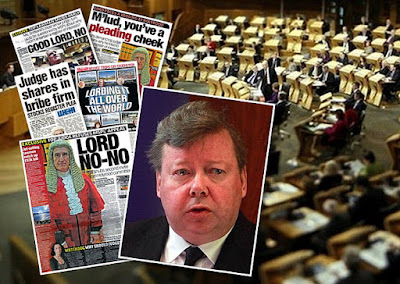 There must be a lot of duck houses to hide if this hugely expensive & unnecessary law complaints quango feels it cannot publish its members expenses claims in the same way politicians at Holyrood, and even Westminster Parliament have been forced to reveal. The Chair's reasons for secrecy are astounding. 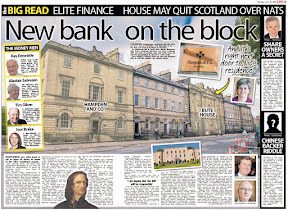 It is very bottom of the barrel stuff for Jane Irvine to claim these extravagantly paid board members mental health or safety could be affected by exposing their expenses claims to public scrutiny." A client who is having considerable difficulty with the SLCC over a serious complaint made against a leading law firm involving fraud also commented, saying : "What's sauce for the goose is sauce for the gander. I have spent months writing back & forth to this high salaried mob at the SLCC about my complaint and am no further forward. In my opinion they don't deserve the flood of money they have received." He continued : "From the way they are treating the public, Jane Irvine should be more worried about the mental health & safety of clients who I also read have been driven to suicide over trying to complain against a crooked lawyer. Maybe the SLCC board members and their fat expense accounts should come down off their perch and treat us a bit better instead of worrying so much about what people will think over their expenses claims." SLCC provided misleading information only admitting to £6k expenses on earlier FOI request. 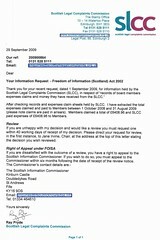 It can also be revealed today that the Scottish Legal Complaints Commission apparently intentionally provided deceptive information to an earlier FOI request from the media over members expenses, where the SLCC claimed the total sums claimed and paid to Members between 1 October and 31 August 2009 at £6408.96. 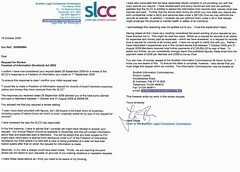 However, when quizzed further on the figures, the SLCC Chair, Jane Irvine issued a new statement contradicting the earlier FOI response on members expenses, and admitted that between 1 October 2008 and 31 August 2009 members received total further payments of a staggering £128,624.00 by way of fees, giving the following 'varying interpretation' reason for the staggering £122,216.00 error in the Commission's expenses accounting figures. SLCC Chief Jane Irvine threatens media ‘no more FOIs’ after asking for board members expenses details. 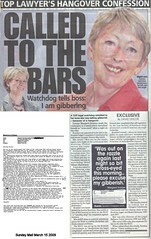 After having to admit the huge discrepancies in the FOI release of expenses claims, the SLCC’s Chair, Jane Irvine, threatened to brand journalists Freedom of Information enquires as “vexatious” as she was forced to admit the huge ‘accounting error’, saying : "Having stated all this I have very carefully considered the exact wording of your request as you have directed me to. This might be read two ways. Either as a request for records of all claims for expenses and money paid as expenses - which we have answered, or a request for records plus a request for records of all money paid. I have not sought to clarify this with you. Rather I have interpreted it expansively and in this context advise that between 1 October 2008 and 31 August 2009 Members received total further payments of £128,624.00 by way of fees." 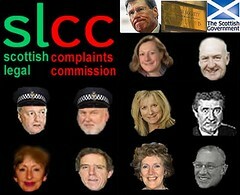 FOI disclosure exposed SLCC Board member Margaret Scanlan who wanted consumer groups excluded from SLCC business. As the SLCC’s new anti-FOI stance gathers pace, Commission insiders have also claimed that in order to stem the rising numbers of FOI requests from the media, necessitated by the Commission’s secrecy policy on just about everything, and the SLCC’s consistently late publishing of monthly minutes (up to six months late in some cases, alongside significant use of black ink) the Commission has also decided to charge for any & all FOI requests, in the hopes of putting off enquiries which may lead to further embarrassing & compromising revelations such as some of those already reported in the media where ‘on the razzle’ board members and senior SLCC officials embarked on bitter hate-fuelled email rants against consumer groups, members of the public, solicitors clients and even media journalists who all came in for heavy criticism and insults after publication of problems at the Scottish Legal Complaints Commission. The SLCC’s refusal to disclose full details of its members expenses has now been passed to Scotland’s Information Commissioner, Kevin Dunion, for a full investigation. Scottish Parliament calls for evidence on public use of courts & legal services. 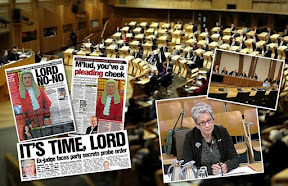 If you have used a Scottish lawyer or the courts and felt the service you did not receive was tip top, or bordered on the woefully inadequate, now is the time to put those experiences in writing by 1st December 2009 to the Scottish Parliament’s Justice Committee, along with suggestions for improvement, and your thoughts on the proposals contained in the Scottish Government’s Legal Services Bill, which hopes to give Scots wider choice of legal representation and a more accessible, competent and trustworthy legal services market than the current broken model, monopolised by the Law Society of Scotland and so poorly regulated that consumer complaints statistics have previously reached staggering heights of up to 8000 cases a year against less than 10,000 solicitors in private practice. The Legal Services Bill concerns the provision and regulation of legal services in Scotland. It takes forward the proposals contained in the Scottish Government’s consultation paper Wider choice and better protection – a consultation paper on the regulation of legal services in Scotland published at the turn of the year. 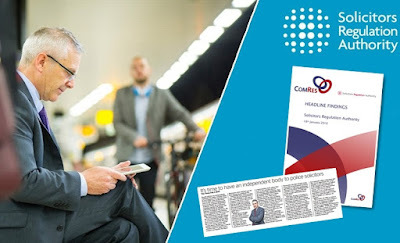 That consultation followed on from reform across the legal services market in the rest of the UK, driven initially by the 2004 report of the European Commission on Competition in professional services and also prompted by a “super-complaint” by consumer group Which? to the Office of Fair Trading. The Bill’s Policy Memorandum advises that the profession is facing significant challenges, including competition from English firms entering the Scottish legal services market and the effects of the economic downturn. The Bill aims to provide the opportunity to offer new forms of service, improve efficiency and innovation within solicitors’ firms, and provide access to different methods of capitalisation. In practical terms, the Bill aims to broaden access to high quality legal services, by allowing solicitors to operate using different business models, for example allowing them to enter into business relationships with non-solicitors, allowing investment by non-solicitors, allowing external ownership and more generally freeing up the market. 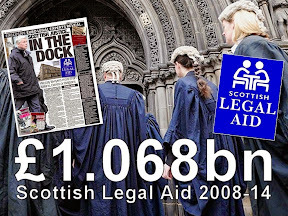 to give the Scottish Legal Aid Board the duty of monitoring the availability and accessibility of legal services. The Scottish Parliament’s Justice Committee is seeking views on the general principles of the Legal Services (Scotland) Bill (The Scottish Parliament: - Bills - Legal Services (Scotland) Bill (SP Bill 30)). The Scottish Government has prepared a Policy Memorandum, Explanatory Notes and other accompanying documents (including a Financial Memorandum) which are published to accompany the Bill. The Bill was introduced in the Parliament on 30 September 2009 and the Justice Committee has been designated lead committee for Stage 1 of the Bill. (The Finance and Subordinate Legislation Committees will also consider the Bill and report to the Justice Committee.) Stage 1 of the scrutiny process is concerned with the general principles of the Bill, although it is also an opportunity to flag up more specific concerns that could be addressed by amendment at later Stages. The Justice Committee hopes to consider written submissions and to take oral evidence during December 2009 and January 2010 and to report on the Bill’s general principles by mid-February 2010. In preparation for this, the Committee invites all interested parties to submit views on the Bill in writing. The Committee is interested to hear the views of all organisations, bodies and individuals on the proposals contained within the Bill and their likely impact. Comments do not have to cover all aspects of the Bill, only those proposals which are of interest or concern. In making a submission, please indicate clearly whether or not you would wish to be invited to give oral evidence to the Committee (on 5 January 2010) to follow up on points made in your submission. If you do wish to give oral evidence, it is essential that your submission is received no later than Tuesday 1 December 2009 so that the Committee can decide, at its meeting on 8 December, whom to invite for the 5 January meeting. (Please note that the Committee may not invite all those who wish to give oral evidence.) If you do not wish to give oral evidence, your submission should be received by the 1 December deadline, if possible, and in any event no later than Friday 18 December. Before making a submission, please read the Parliament’s policy on treatment of written evidence by subject and mandatory committees. Written submissions should normally be limited to around 4 sides of A4 but, if they need to be much longer than this, they should be accompanied by a short summary of the main points. Submissions should be set out in numbered paragraphs. Where the submission refers to existing published material, it is preferable to provide hyperlinks or full citations (rather than extensive extracts). The Committee welcomes written evidence in English, Gaelic or any other language. The Committee prefers to receive written submissions electronically (preferably in Microsoft Word format). These should be sent by e-mail to: lsbill@scottish.parliament.uk However you may also make hard copy written submissions to: Justice Committee, Room T3.60 ,The Scottish Parliament, Edinburgh. EH99 1SP Telephone : (0131) 348 5047. I would encourage anyone who has used legal service in Scotland, to contribute to the Justice Committee’s deliberations on the Legal Services Bill to ensure that a much fairer system of legal services & wider choice of representation is put in place for all Scots. Your input into the debate will ensure the public’s voice is heard against the special vested interests of the legal profession and those who wish to retain market dominance over your right to choose who you want to handle your legal interests. Labels: access to justice, Consumer Focus Scotland, Law Society of Scotland, Legal Services Bill, Scottish Government, Scottish Parliament, Which? 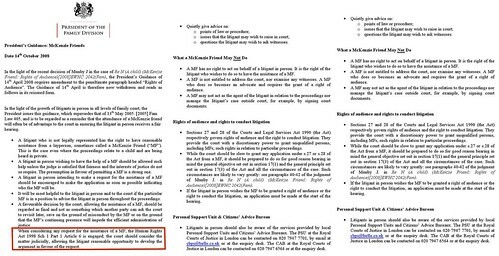 Scottish Parliament asks Lord Hamilton & Justice Secretary MacAskill : 'Do you support McKenzie Friends for Scotland' ? Lord President Lord Hamilton. The Scottish Parliament's Petitions Committee has written to Scotland's Chief Judge Lord Hamilton, the Lord President, and the Justice Secretary, Kenny MacAskill, asking them both if they support the introduction of McKenzie Friends for Scotland, some forty years after McKenzie Friends were first introduced to the UK Courts of England & Wales. Lord Hamilton asked if the Court of Session supports McKenzie Friends. Holyrood's Petitions Committee recently considered Petition 1247 (McKenzie Friends for Scotland) and concluded the next step forward would be to ask the Lord President outright what his position is on the issue of McKenzie Friends. The Petitions Committee writes : "The purpose of this letter is to seek a written response to the following specific question: in light of Lord Gill’s review, what is the position of the Court of Session on the introduction of a McKenzie friend ?" *What is its timetable to respond to Lord Gill’s review? *Does it support the review’s recommendations as far as “McKenzie friends” are concerned and will it therefore introduce a McKenzie friend to assist a party litigant? If so when? *What is its answer to Margo MacDonald’s point about the decision of Sheriffs to invite a McKenzie friend?" Justice Secretary Kenny MacAskill ‘caught out’ on speed of Holyrood’s McKenzie Friends Petition. 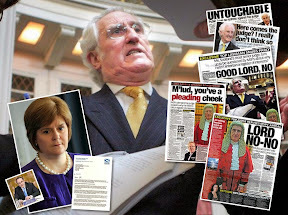 Legal insiders today branded the Scottish Government’s response on the petition so far as lacking in direction, claiming the Justice Department had been caught out on the issue of McKenzie Friends and the speed of the actual petition, with Ministers being left red faced and without honest explanations as to exactly why McKenzie Friends had been kept out of Scotland for the past forty years. 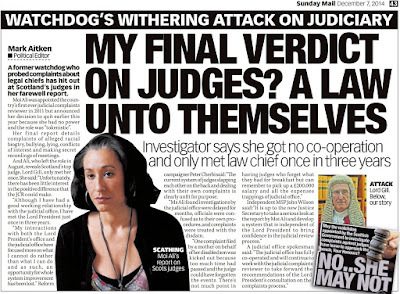 He continued : “Clearly the powers that be, and that seems to include the Scottish Government, do not wish to lose control of the courts process where they may well be faced with difficult cases which cannot be so easily buried in the sands of time." An official from one of Scotland’s consumer organisations welcomed the continued attempts from the Scottish Parliament to pursue the McKenzie Friends question, urging speedy progress to help party litigants already caught in the mire of complicated & difficult practices in Scotland's courts system. 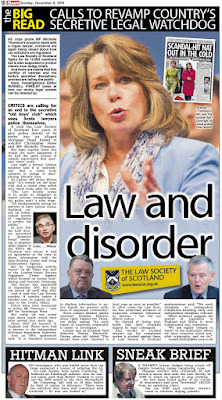 She said : "I am happy to see the Petitions Committee continue to pursue the Scottish Government & Lord President over the McKenzie Friends petition but it does seem to me that steps will have to be taken by the Parliament to ensure that party litigants have a right enshrined in law to call upon the services of a McKenzie Friend in a Scottish court, rather than leave the whole thing up to the courts discretion on a case by case basis, which in itself is an abuse of the individual's rights as we see in comparison of how the McKenzie Friend facility is applied, quite fairly, in England & Wales." There is of course, no reason why the Scots public should be continually denied a legal right which has applied in the rest of the UK for forty years. Please support the campaign to bring McKenzie Friends to Scotland, ensuring it becomes a right for court users to avail themselves of the services of a McKenzie Friend in Scotland's courts. Scotland's Judicial Appointments Board - full of old boys itself. 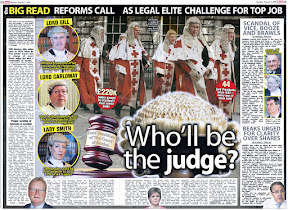 With much fanfare yet little surprise, Scotland's Judicial Appointments Board, the Ministerial appointed 'quango' which helps appoint Scotland's judges and sheriffs, has published research which ironically claims that jobs for judges are influenced and controlled by the legal profession's old boys network. 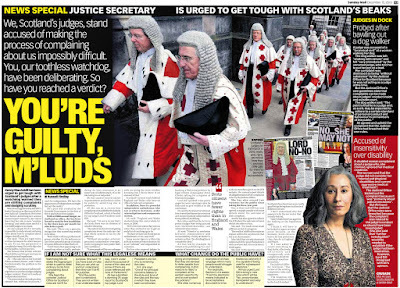 The research, which started after a Sunday Herald investigation found that most of Scotland's judges have identical backgrounds (approaching clone status) found about 67% of members of Scotland's legal profession, of whom only around 19% replied (a total of 2319 responses received), that “being in the right social network” influenced which members of the legal profession went on to become a sheriff or a judge after a few nods & winks from those already in the judiciary. Scotland’s Lord President, Lord Hamilton. 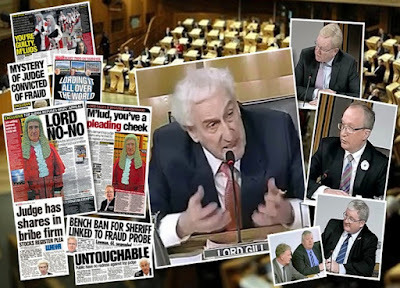 Lord Hamilton, who recently stated to the Scottish Parliament he should be able to tap someone on the shoulder and make them a sheriff, commented on the research, saying : "It is of the first importance that individuals appointed to judicial office are of the highest calibre. Selection for appointment must be solely on merit but it is essential that applications should be encouraged from the widest range of persons eligible. I welcome the Board's decision to instruct this survey and look forward to having the opportunity to examine its results." 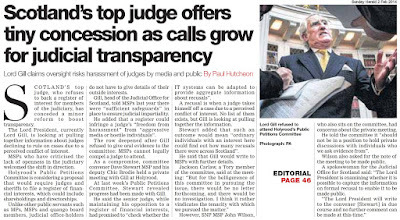 Lord Hamilton speaks on judicial appointments ..
Law Society of Scotland President, Ian Smart. The Law Society of Scotland were also quick to get their oar in, with a statement from Ian Smart, who said : "Following the publication of the Gill Report, we are potentially entering a completely new era in the field of judicial appointments. Against that background particularly, this is important research indicating the willingness of JABS to continuously improve and modernise the recruitment process and to encourage applications from candidates from all strands of the legal profession. 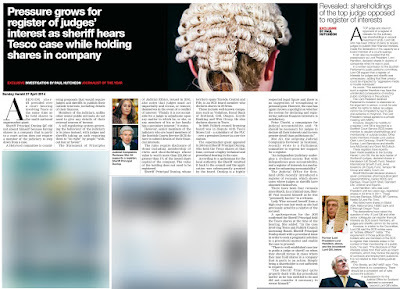 It will be interesting to monitor future developments in judicial appointments as a result." Volume 1: Main Report Volume 2: Tabular Report Comparison paper on the "Three Surveys ..... Same Answers? 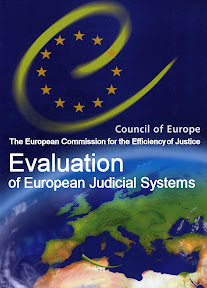 ", and for comparison, the Judicial Appointments Commission (for England and Wales) and the Northern Ireland Judicial Appointments Commission have undertaken similar research within their jurisdictions. 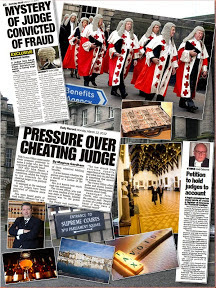 For further information on their research work, please visit: JAC's "Barriers to Applications for Judicial Appointment Research" NIJAC's "Research into Barriers and Disincentives to Judicial Office"
However, the Judicial Appointments Board’s desire to get the message out on ‘jobs for the boys’ in Scotland’s courts, necessitates a closer inspection of the JAB itself …. Justice Secretary Kenny MacAskill appoints JAB members on the ‘recommendation’ of Scotland's Lord President Lord Hamilton. 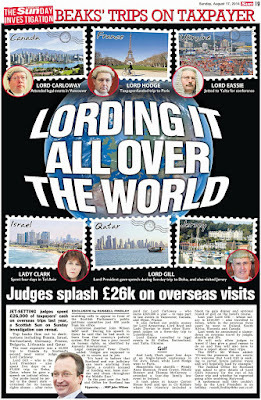 Unsurprisingly, while the Judicial Appointments Board's research, carried out by an external consultancy at cost to the taxpayer claimed old boys networks controlled judicial appointments, the JAB failed to mention that some of its own members, all Ministerial appointees are themselves well known in legal circles for being part of old boys networks which have helped cover up some of the worst scandals to hit Scotland's legal profession for decades. 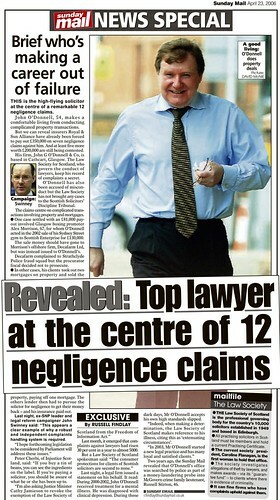 Martin McAllister played a key part in huge Law Society claims cover up scandal which toppled Douglas Mill from his post. One fine example of old boys network appointments to the Judicial Appointments Board itself, would be that of the case of JAB member Martin McAllister, whose name featured heavily in the 'Law Society of Scotland secret memo claims scandal' where secret memos, sent to Mr McAllister (who was at the time President of the Law Society) by his [then] Chief Executive colleague Douglas Mill, exposed a policy of concerted and deliberate actions aimed at controlling and curtailing claims & complaints made against 'crooked lawyers' by members of the public. 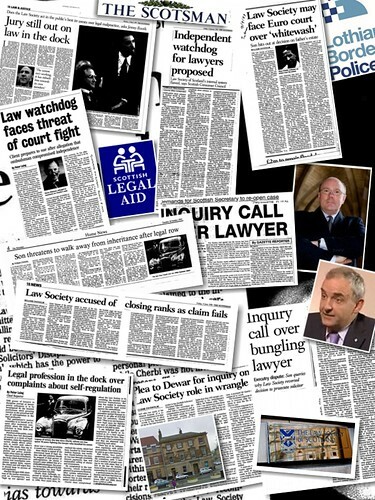 Cabinet Secretary John Swinney exposed Law Society claims fixing scandal involving Martin McAllister. 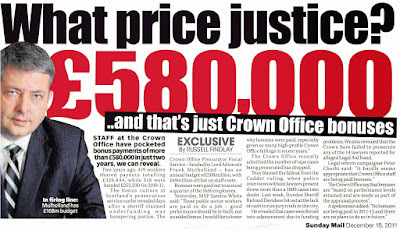 Oddly enough, when Mr MacAskill was asked about Martin McAllister's part in the claims fixing scandal, the Justice Secretary denied any knowledge of the matter, this despite the fact Mr MacAskill's Cabinet colleague, the Cabinet Secretary for Finance, John Swinney, exposed McAllister & Mill's secret memos & deliberate actions against members of the public, during recorded hearings of the Scottish Parliament's Justice 2 Committee, where Mr Swinney's confrontation with Douglas Mill over the memos addressed to Martin McAllister, eventually led to Mill's downfall as Chief Executive of the Law Society of Scotland after 11 years in the job. Cabinet Secretary John Swinney confronted Douglas Mill over claims fixing memos involving the then Law Society President Martin McAllister. 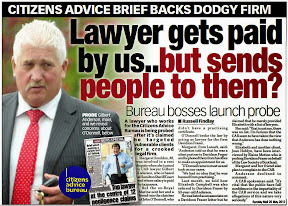 Memos of a feather flock together as Mill’s secret memos to Martin McAllister proposes ways to kill off claims & complaints against crooked lawyers. 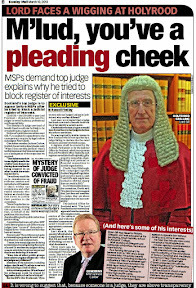 You can read my earlier report on Mr McAllister's controversial appointment to the Judicial Appointments Board, including details of those secret memos here : Justice Secretary MacAskill denies knowledge of ‘claims fixing’ memos identifying former law chief sent to Judicial Appointments and decide for yourselves how the old boys network control even appointments to quangos such as the Judicial Appointments Board who themselves, make the appointments of Scotland’s judges. Sir Muir Russell became Principal of the University of Glasgow in October 2003. He was born in 1949 and was educated at The High School of Glasgow and Glasgow University, where he took a first class honours degree in Natural Philosophy. Prior to his appointment at the University of Glasgow he was Permanent Secretary to the Scottish Executive. He was elected as a Fellow of the Royal Society of Edinburgh in 2000 and holds honorary degrees from the University of Strathclyde and the University of Glasgow. His interests include music, food, wine and occasional golf. Sir Muir was appointed to the Board in October 2008 for three years. Elspeth MacArthur's background is in human resources and she has been Director of Human Resources at the University of Edinburgh for the past nine years. Ms MacArthur is also a member of the Board of Management at the John Wheatley College, which is committed to regeneration and combating social exclusion in the east end of Glasgow. Ms MacArthur was appointed to the Board in July 2007 for three years. Sandy Mowat's background is in business as a Chartered Accountant. He was senior and managing partner of Alexander Sloan, Chartered Accountants until he retired in late 2007. He now practices on his own account and holds a number of non-executive directorships and charity trustee appointments. 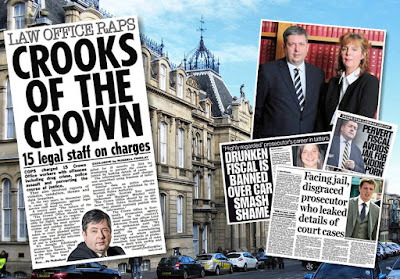 In April 2008 Mr Mowat was appointed to the Investigation and Enforcement Committee of The Institute of Chartered Accountants of Scotland and in April 2009 was appointed Secretary and Treasurer of The Baird Trust. Mr Mowat was appointed to the Board in January 2008 for three years. Andrew Coyle is Professor of Prison Studies in King's college, University of London. Between 1997 and 2005 he was founding Director of the International Centre for Prison Studies in King's College. He is a prisons adviser to several United Nations bodies and to the Council of Europe. He is a member of the Foreign Secretary's Expert Panel against Torture and of the National Advisory Body on Offender Management. He worked for 25 years at a senior level in the prison services of the United Kingdom. While in the Scottish Prison Service he was Governor of Greenock, Peterhead and Shotts Prisons. 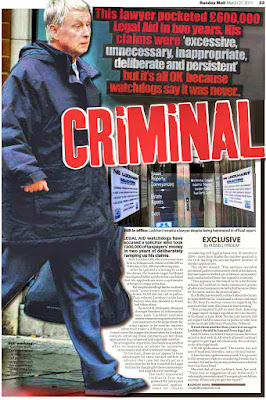 Between 1991 and 1997 he was Governor of Brixton Prison in London. He was appointed a Companion of the Order of St Michael and St George in 2003 for his contribution to international penal reform. He is a Fellow of King's College London. Professor Coyle was appointed to the Board in January 2009 for three years. John Miller was born in 1941. After university he was a youth worker at a church in Niddrie, Edinburgh. He became a minister of Castlemilk East Parish in Glasgow in 1971. He and his wife Mary were closely involved in the life of the Castlemilk housing scheme for the next 36 years. From 2001 to 2002 he was Moderator of the Church of Scotland's General Assembly, representing the Church of Scotland at national and international level. He then returned to parish life. In 2005 the Lord Provost awarded him the Glasgow Loving Cup for his contribution to the City. On retirement in 2007 John and Mary Miller spent 18 months working in Zimbabwe. Reverend Miller was appointed to the Board in March 2009 for three years. Lady Smith was appointed a Judge of the Supreme Court in 2001. She is a graduate of the University of Edinburgh. She was admitted to the Faculty of Advocates in 1980 and was Standing Junior Counsel to the Countryside Commission. Lady Smith was appointed Queen's Counsel in 1993. She served as a Temporary Sheriff from 1995 to 1999. 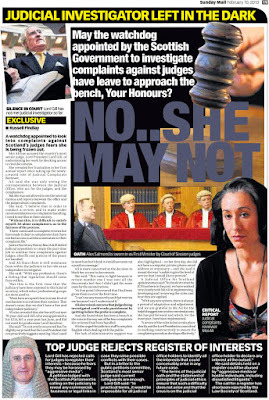 Lady Smith was appointed Chair of the Scottish Partnership on Domestic Abuse from 1998 to 2000 and served as Advocate Depute from 2000 until she was appointed a Judge. She has served as a member of the Court of Session Rules Council and is a past Chair of the Advocates Family Law Group and Chair of the Advocates Professional Negligence Law Group. Lady Smith was appointed to the Board from July 2008 for three years. After qualifying as a solicitor he worked in London and Glasgow for three and a half years. He then trained as an advocate and was called to the Bar in 1977. He was appointed as a Sheriff in 1984, serving in Glasgow and Greenock. 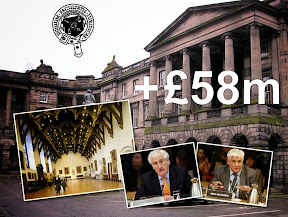 In 2001 he was appointed Sheriff Principal of Grampian, Highlands and Islands, where he is responsible for the administration of justice in the sheriff courts throughout the North and North East of Scotland and the Western and Northern Isles. Sheriff Principal Young was appointed to the Board in June 2007 for three years. Sheriff Ross was appointed a Sheriff in 1997, serving at Linlithgow until 2000 and since then at Dumfries. 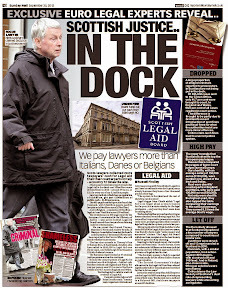 He is a graduate of Edinburgh University and qualified as a solicitor in 1973. From 1975 until 1997 he was a partner in the firm of Gillespie, Gifford & Brown, Solicitors, Dumfries. He served on the Council of the Law Society of Scotland from 1987 until 1996, convening the Complaints and Guarantee Fund Committees. He was President of the Law Society of Scotland in 1994/5. 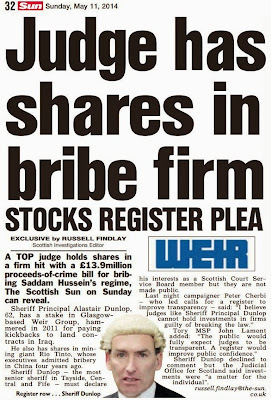 He sat as a Temporary Sheriff between 1987 and 1997 and has been a member of the Scottish Legal Aid Board since 2004. Sheriff Ross was appointed to the Board in October 2008 for three years. Mr Martin was admitted to the Bar in Scotland in 1976 and in England and Wales in 1991. He became a Queen's Counsel in 1988. He was the Dean of the Faculty of Advocates from 2004 to 2007. Mr Martin has served as a Temporary Sheriff, a part-time Chair of Industrial Tribunals, and is currently a Chair of the Police Appeals Tribunal. He is a Governor of Loretto School and a Trustee of the National Library of Scotland. Mr Martin was appointed to the Board in June 2007 for three years. Mr McAllister is a partner with Taylor and Henderson Solicitors based in Saltcoats, Ayrshire. He is a former president of The Law Society of Scotland and has convened several of its Committees including Legal Aid, Professional Practice and Professional Conduct. Mr McAllister is currently a part time tutor at Glasgow Graduate School of Law and a part time Convenor of The Mental Health Tribunal for Scotland. Mr McAllister was appointed to the Board from September 2008 for three years. 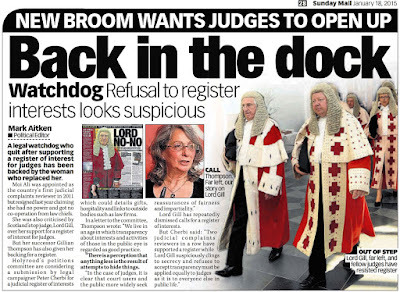 Surely its now time to make the appointments of Scotland’s judiciary a lot more transparent than this lot could ever manage ? After all, do the courts not serve the public and the interests of justice, rather than so obviously serving themselves ? 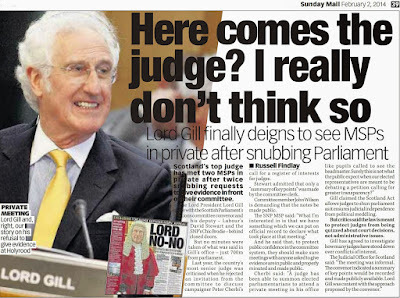 Scottish Parliament debated Lord Gill’s Civil Courts Review. Last Thursday's Scottish Parliamentary debate on the Civil Courts Review recommendations made by Scotland's Lord Justice Clerk, Lord Gill has left most onlookers and legal insiders with a worry that many of the reforms proposed in the two year review on Scotland's Civil Justice system, including the implementation of McKenzie Friends & Class Actions, will suffer long delays and in some cases, may almost certainly never be implemented in ways which would help ordinary Scots gain significant improvements in using Scotland's "Victorian" justice system. Mr MacAskill went on to say : “In his opening paragraphs Lord Gill pulls no punches. 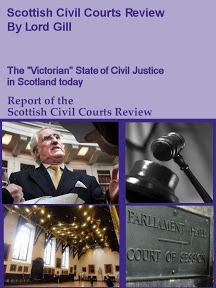 He says: "The basic structure of civil jurisdictions in the Scottish courts remains much as it was in the late nineteenth century".He continues:"changes in the social and economic life of Scotland ... have left us with a structure of civil justice that is seriously failing the nation. Reform is long overdue." “Those conclusions are unavoidable. Our civil courts now operate in a rights-based, property-owning, consumer-oriented, insurance-reliant society of a sort that would have been unrecognisable a century ago. A reliance on ad hoc reforms has delivered a system of civil justice that is unfit for today's purposes. Lord Gill states: "The practitioners of 100 years ago would have little difficulty in picking up the threads of today's courts. The severe summary is that the structure is "seriously failing the nation." Margo MacDonald MSP asked Kenny MacAskill when justice reforms would begin. Early intervention from independent MSP Margo MacDonald on the question of which areas had been identified by the Justice Secretary for a start, along with comments from the Liberal Democrat Justice Spokesman Robert Brown on points made by Lord Gill that his report ‘was not to be cherry picked and should be dealt with as a whole’, appeared to leave Mr MacAskill grasping for explanations as to what could and could not be done by the current Scottish Government. 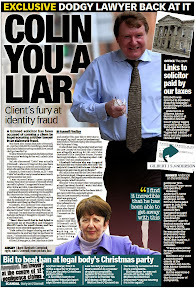 Further hints at delays to Lord Gill’s proposals were compounded by questions from Scottish Labour MSP David Whitton, on the subject of McKenzie Friends, which also left Mr MacAskill struggling for an immediate solution to the forty year old McKenzie Friend 'Scottish problem' , the blame of which sits squarely with the Courts and Scotland’s legal establishment. He continued : “We must make expeditious progress on Lord Gill's enlightened recommendation on McKenzie friends. The first thing that can be done is for the courts to grant McKenzie friend rights with immediate effect. There is no need for legislation from the Parliament, as it is within the powers of the courts to grant those rights. That would demonstrate the intent that things are going to change. 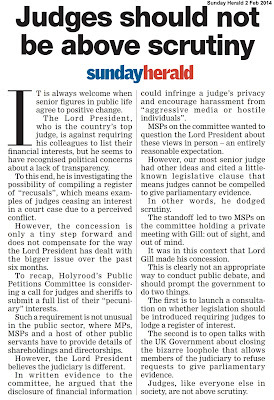 The public want that change, Lord Gill has recommended it, the consumer associations support it, and it is an equitable and compassionate remedy for some of the access-to-justice restrictions in Scotland. The outcome for the ACA was less than fair, due to the fact they were given a heavily restrictive practicing certificate for construction law only, with their application apparently being fought & lobbied against by the legal establishment at every stage. The ACA’s battle to gain rights of audience may also indicate a long struggle ahead on the issue of McKenzie Friends and other access to justice reforms proposed by Lord Gill. Community Safety Minister Fergus Ewing stumbles over McKenzie Friends for Scotland after 40 years of existence in England & Wales. 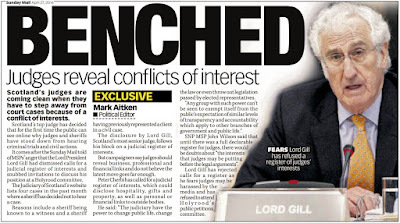 On the whole I would say the debate was positive, albeit there are obvious indicators the implementation of Lord Gill’s recommendations will take time, and will be met with obvious & stiff resistance from the legal establishment. Several solicitors and legal insiders I have spoken to since the debate point to many uncertainties over Lord Gill’s proposals, resistance from the legal establishment over changes that many within its ranks do not want, and the inevitable arm twisting of politicians by the likes of the Law Society of Scotland, who although have welcomed Lord Gill’s report, are actually fuming over many of the proposals to give the public greater access to justice, and the chance to bypass Scotland’s hugely expensive solicitors to do it. I honestly feel that as far as McKenzie Friends go, there will have to be some kind of legislation to ensure that having a McKenzie Friend is a Human Right, and not something at the whim or discretion of the court. 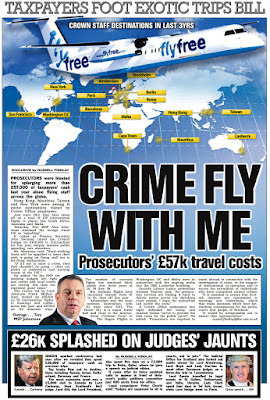 The court has after all, kept out McKenzie Friends from Scotland for some forty years, and both the governing bodies of Scotland’s legal profession – the Law Society of Scotland and the Faculty of Advocates, do not even recognise the fact that McKenzie Friends are treated as Human Rights issue in England & Wales, and in many jurisdictions around the world. 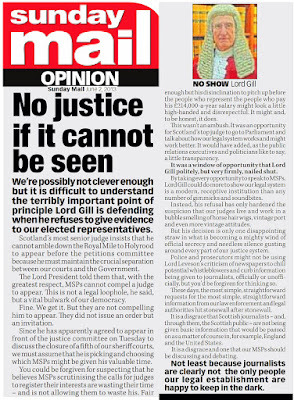 If we are to have certainty over the McKenzie Friends question, and many other recommendations of Lord Gill, I foresee the legislative route must be used to force the courts to ensure access to justice for all, rather than access to justice only for those the court feels should have it. 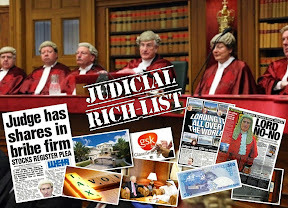 The legal establishment and the courts, will again no doubt argue that we are special in Scotland, and have a peculiarly special legal services market which may be damaged by some of Lord Gill’s proposals including McKenzie Friends. However, the truth is, we are only special in Scotland because the legal establishment actively denies access to justice to those it does not want to achieve access to justice. Scotland's Lord President Lord Hamilton. FORTY YEARS after McKenzie Friends entered into the English Courts system, Scotland's Chief Judge Lord Hamilton, the Lord President, is to be asked by the Scottish Parliament's Petitions Committee to implement McKenzie Friends in Scotland's courts, after growing calls from MSPs were made at this week's public petitions hearing on Petition 1247 (McKenzie Friends for Scotland) in support of implementing the long held right in England & Wales for courtroom assistance for unrepresented litigants. 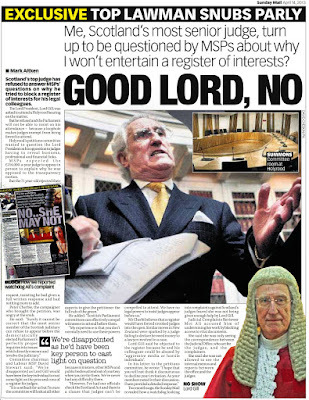 Scottish Judge Lord Woolman claimed McKenzie Friends were a matter for Parliament, not the Court. 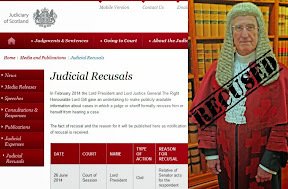 However, while Lord Hamilton is to be asked by Parliament on the implementation of McKenzie Friends in his own courts, I can exclusively reveal the first test request of a McKenzie Friend since the publication of Lord Gill's Civil Justice Review last week FAILED after High Court judge Lord Woolman rejected a request for a McKenzie Friend last Friday, made by a party litigant in a 'high value' damages case. 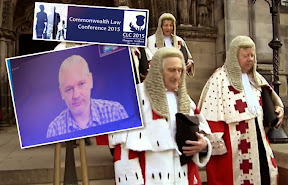 It transpires this was the second refusal by the Court to allow the request of appearance of a McKenzie Friend in the same case, the Court claiming on this latest occasion that this was a matter for, and currently being discussed by, the Scottish Parliament. 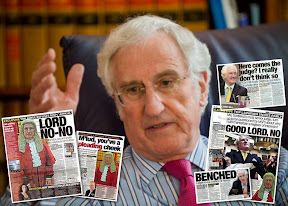 Lord Gill’s recommendations on McKenzie Friends were tossed aside by fellow judges the day after publication. The courts resistance to allowing a McKenzie Friend, even apparently against the recommendations of Lord Gill’s Civil Courts Review, sets the scene for an extraordinary tussle between the Scottish Parliament and Scotland's Judiciary over the Courts responsibilities to ensure fair & equal access to justice for both sides, with, on one side, the Scottish Parliament Petitions Committee seeking to persuade Lord Hamilton to introduce McKenzie Friends in Scotland's Courts, and elements of the Judiciary on the opposing side, claiming it is a matter solely for the Parliament, and nothing to do with the court. While it appears Scotland's judiciary, along with the Law Society of Scotland, Faculty of Advocates, and even the Scottish Government are all opposed in some way or another to the introduction of a McKenzie Friend to assist party litigants, the English courts introduced the McKenzie Friend facility without much problem some forty years ago. 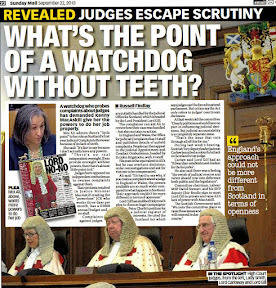 The English legal system, along with their courts and legal services market, did not collapse into anarchy, as the Scottish legal profession seem to be claiming will happen if McKenzie Friends were introduced in Scotland. 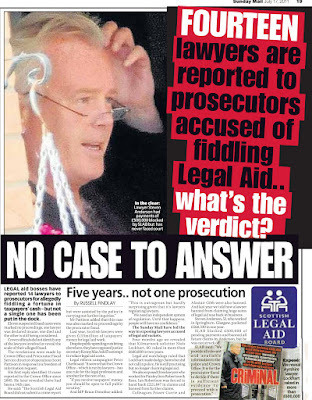 Rather it appears the driving force behind objections from the Scottish legal establishment to the introduction of McKenzie Friends, are solely based on the fact solicitors will lose fees if the public decide to take a McKenzie Friend along with them to court, instead of a costly 20,000 plus solicitor & legal team who may very well end up ruining their case as the statistics seem to indicate in Scotland's currently poorly served legal services market. Now, to the report of this week's Petitions Committee hearing. Holyrood's gem, Margo MacDonald speaks in support of McKenzie Friends petition, joined by the petitioner's constituency MSP, Murdo Fraser. Margo MacDonald spoke of a McKenzie Friend 'being a right' in England & Wales. Margo MacDonald attended this week's Petitions Committee hearing and spoke further on the advantages of allowing McKenzie Friends in Scotland's courts. Margo MacDonald said : "This is a system of support for litigants in courts which has been running successfully in England for a long time. It seems to offer a greater level of support and a feeling of security for many people going into court to plead for themselves. The McKenzie Friend does not plead directly for them, the McKenzie Friend offers advice quietly given perhaps hands over relevant papers at the relevant time perhaps back up work"
"I’ve looked at the response from Lord Gill because it was referred to the Faculty of Advocates who said 'we will wait to see what Lord Gill's review says' and he's not all that keen, but I think most parts of the Scottish legal establishment are not all that keen on having lay people in court and they are very very careful about it"
"Now I think they do so for reasons I approve of in they want to maintain their very high standards of advocacy and protection of the client in the Scottish courts but in this one i think we could take a leaf out of what happens in the English courts and add a greater level of support for litigants who may be rather overawed by court procedure"
Margo MacDonald also reminded the Petitions Committee that having a McKenzie Friend in England & Wales was a right, and not something which should be under the sole approval of a Sheriff or the court, stating : "Lord Gill I think suggests it should be up to the sheriff to decide whether or nota McKenzie Friend would be allowed to be alongside the litigant whereas in England I think they have a right to be there"
Scottish Conservative Murdo Fraser MSP also supports the introduction of McKenzie Friends in Scotland. Murdo Fraser, attending the Petitions Committee in support of the McKenzie Friends Petition said "Mr MacKenzie is a constituent of mine and I'm happy to be here to support the petition because I actually agree with everything Margo MacDonald has just said." He continued :"Can I say I think the proposal from Mr MacKenzie is a very reasonable proposal and makes a sensible suggestion. The McKenzie friend is there to provide assistance to a party litigant. It was interesting to read the response on the Civil Courts Review which very much majored on the issue of whether the McKenzie Friend should be given rights to be heard in court. Now as I understand from Mr MacKenzie that is not the issue. He is not actually seeking for the McKenzie Friend to be heard in court. All he is seeking is the right of a party litigant to bring somebody with them to sit beside them and provide them with assistance." "There is nothing I read in the representations that really strongly argue against that. The proposal is supported by Which?, the Scottish Consumer Council and Money Advice Scotland. I think it would be a fairly simple thing to introduce and I think it would be very much to the benefit of party litigants and improve the justice system." Nigel Don MSP, Petitions Committee member and Parliamentary liaison officer to Kenny MacAskill Nigel Don said "Can I first recognise that previous contributors have brought out the distinction between those who are there as a friend and those who are there as a right of audience which is one I wanted to make sure we covered." He continued : "It does seem to me from everything so far that I've heard this is something the court could introduce themselves. 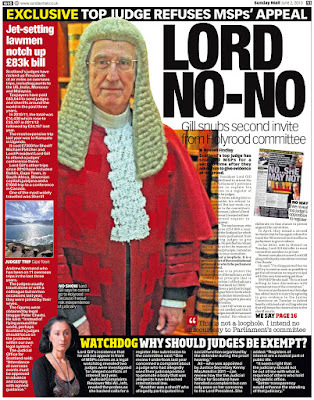 I don't think it took Lord Gill to say it would be a good idea. In fact I think he has gone beyond McKenzie Friend as you said, and therefore I wonder whether in fact the first person we should write to is actually the Lord President because it is he who runs the courts and ask him whether there are any plans within the courts system to alter their practice because it is he who presides over them as the government doesn't actually deal with this." "We might secondly want to write to the government asking its attitude but I think we should start by asking the Lord President if whether he feels there is something he can do. I think he can but he is the judge of that and whether he is minded to do so." Petitions Committee member Bill Butler MSP (Scottish Labour). Bill Butler said "Just to say I agree with everything that been said. We have some quotes from Lord Gill's review where he's very careful with the phraseology he uses or employs, he's for it and in certain circumstances a person being able to address the court on behalf of a party litigant. I do think we should follow Nigel’s suggestions and write to the government asking if they will come on board." 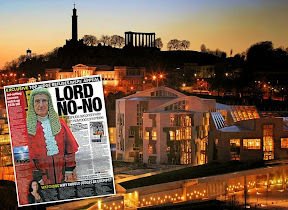 While the Petitions Committee has agreed to write to Lord Hamilton in the terms specified, in all honesty I do not think Lord Hamilton will budge on the issue of McKenzie Friends, or indeed many of the other reforms in Lord Gill’s Civil Courts Review, which appear to be on the ‘watering down list’ at the Scottish Government’s Justice Department. Even if the Lord President does manage to do something on McKenzie Friends without the need of a legislative push, we can be assured there will be a set of intolerable conditions that no English court, or indeed any court in other national jurisdictions where McKenzie Friends exist, would accept. The Blame Game : Kenny MacAskill piles blames for access to justice delays on Lord Hamilton. McKenzie Friends for Scotland should be introduced without further delay. However, given the continuous resistance from the legal profession and the courts system itself, I feel there must be legislation to ensure there are proper rules laid down on the use of McKenzie Friends, and the right of an individual to request and receive the services of a McKenzie Friend laid down in no uncertain terms to the court, a right that people in the rest of the United Kingdom enjoy. Scotland's Human Rights Commission argue against Human rights of having a McKenzie Friend in Scotland. In a move condemned by some senior legal & consumer figures this evening, the Scottish Human Rights Commission have written to the Scottish Parliament Petitions Committee on the subject of Petition 1247 McKenzie Friends for Scotland, voicing argument & opposition to giving Scots court users the 'Human Right' of a McKenzie Friend, a right which has been respected as an Article 6 Human Right in England & Wales for several years, according to advice given out by the Lord President of the English courts, and backed by the UK's Ministry of Justice. Curiously, the SHRC’s apparent opposition to McKenzie Friends as a ‘Human Right in Scotland’, seems to fit in with the negative views expressed so far by the Law Society of Scotland and the Faculty of Advocates, who both oppose the introduction of McKenzie Friends to Scotland’s courts, as I have reported earlier HERE and HERE. SHRC argued in their submission to Holyrood’s Petitions Committee that it would be better for litigants to pay a lawyer to represent them in court than have a McKenzie Friend ! The English approach – McKenzie Friends are treated as a Human Rights issue on advice of the Lord President. 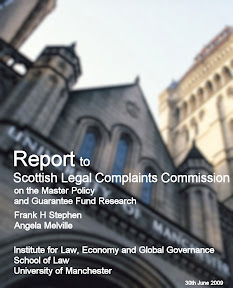 A senior figure in one of Scotland's consumer organisations attacked the SHRC's statement as profoundly shocking for party litigants in Scottish courts, claiming the commission's letter "sounded more like a pitch for business for lawyers than a defence of something already accepted as a right in England & Wales". He said : "I am surprised by the negativity and tone of the SHRC's response to the Petitions Committee on the subject of McKenzie Friends." 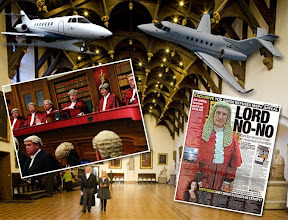 "It is widely accepted in the English courts that litigants can request the presence of a McKenzie Friend, which the court usually looks on as an Article 6 Human Rights issue, as offered in advice from the Lord President of the Family Division, English Courts." He continued : "While I respect the references used in the Human Rights Commission's reasoning, I feel their submission looks more like a pitch for forcing litigants to use lawyers, but they have not tackled the argument as to what happens if that litigant cannot obtain access to legal representation." “I feel the SHRC has played a very dark hand making this submission on the day before the Petition is to be heard, after, I understand, having been asked to make a submission several months ago. One could be forgiven for thinking the SHRC are attempting to undermine the Petition itself with their rather poor showing." A senior solicitor who was asked for comment on the SHRC's response to the McKenzie Friends Holyrood Petition said he was astonished the Commission had apparently went so far out of its way to argue that having a McKenzie Friend was not a Human Right. He said : "I think people are going to look at the Commission’s letter to the Parliament and wonder why they actually exist if they are so set against issues which are handled as Human Rights entitlements in one part of the country, but not in Scotland." He continued : "I don't see why the Scottish Border with England should be the crumbling point for individuals rights, where Scots clearly have less rights than people in England & Wales, and then we have this notion where those very organisations funded by the public in Scotland to protect & promote Human Rights, will go out of their way to argue against the very issues they are charged with protecting." "Many solicitors in the legal profession I know, including myself, do not have a problem with McKenzie Friends appearing in Scotland's courts. 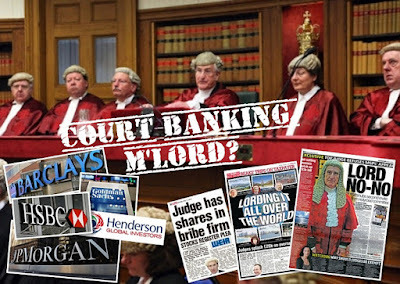 However, there is clearly a movement within the legal profession who do not wish to see McKenzie Friends operating in the Scottish courts, and in these testy financial times, I would put that down to fear of the competition and lost business, not really anything to do with arguments of lawyers being able to give a litigant a better service, which I would be the first to admit, may not always be the case." In an interview this evening, Mr Stewart MacKenzie, the Petitioner who raised the McKenzie Friends for Scotland Petition 1247, said he was disappointed with the Scottish Human Rights Commission's Parliamentary submission. "If I as a party litigant who cannot obtain legal representation through the services of a solicitor, want a note taker or assistant in court it should be my right to have that just as people in other parts of the country, and other parts of the world can have without all this opposition from the legal profession in Scotland. We are talking about helping people in court here, not representation or advocacy. McKenzie Friends should be a right for all and that is why I raised my petition at the Scottish Parliament." I would certainly have to agree with Mr MacKenzie's point of view, and also, am left wondering why the Scottish Human Rights Commission have written a reluctant letter to the Scottish Parliament shying away from backing McKenzie Friends as a Human Right. The Scottish Human Rights Commission claim on their website : "The Scottish Human Rights Commission promotes and protects the human rights of everyone in Scotland. We are working to increase awareness, recognition and respect for human rights in Scotland by bringing human rights into everyday life. The Commission is dedicated to helping everyone understand their rights and the shared responsibilities we all have to each other and to our community. The Commission is independent of the UK and Scottish Parliaments and Governments." One could easily conclude from the SHRC's response to the Scottish Parliament, the individual’s Human Rights may only go so far in Scotland ... perhaps to the point of a solicitor's fee note, and if you cannot get a solicitor to act for you, you don't have Human Rights …. which is most certainly an odd way of looking at things. No one at the SHRC was available for comment this evening. The Scottish Parliament’s Petitions Committee will hold its latest hearing on Petition 1247 (McKenzie Friends for Scotland) at Holyrood on Tuesday 5 October 2009.